Ah, summer. For the CTL summer staff, this is time for shifting into shepherding new projects to completion for the coming academic year , for reading and reflecting that will lead to course revisions, and for collaborations and consultations with peers as we revise existing programs, resources and workshops. One project draws on all of this summer work as we move forward in making our face to face “Making a Difference in Teaching and Learning Seminars” – or MAD Seminars – into virtual space. Through the F2F MAD Seminars, small groups of faculty have created new courses by working with concepts we’ve presented in this blog across its first year: Backward Course Design, also known as Aligned Course Design; SUCCESS / Sticky Teaching principles; and pedagogies that support more learning for more students. To broaden access and participation – by creating a virtual space to support asynchronous, group and individual participation – we will launch a Moodle-based Aligned Course Design resource featuring virtual resources and conversation in late August. What you have with this blog post is the first in a four-part series of short multimedia presentations we are creating to introduce each major design component: teaching/learning atmosphere, aims, activities, and assessments. Each segment will set out core concepts, offer a narrated presentation to build on those concepts, share work guides for offline support, provide a transcript with talking points and further resources through embedded notes, links, and citations. So, welcome to our first-run of the multimedia presentations with today’s blog post featuring the segment that sets the context overall, then moves into setting out environmental factors that can impact and inspire teaching, encourage and engage learning. 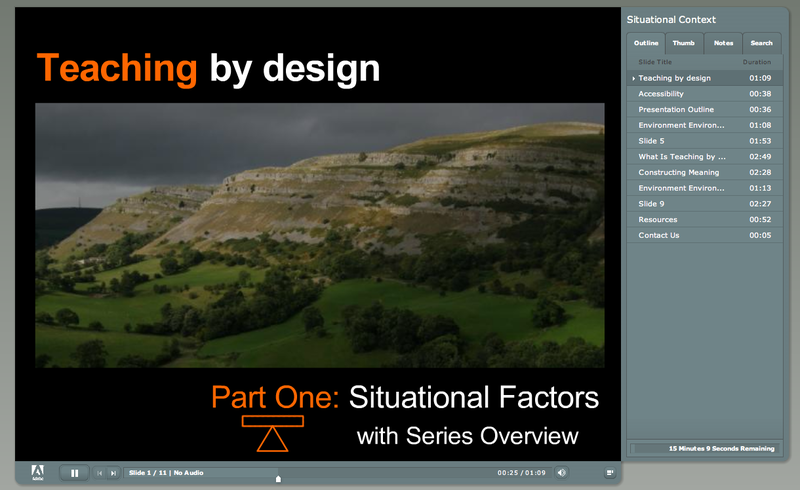 Once your click here – Tapa #1 – Environmental Factors & Series Overview – you’ll be directed to a portal housing the “Teaching by Design” presentation series. From there you’ll be able to download a PDF conveying this Adobe Presenter session. At times, Adobe presentations run sound only after a file is opened a second time. Happy summer testing, shaping, reading, reflecting, consulting and designing to you! Additional Resources supporting Tapa #1: Teaching by Design – Session 1 Slides, Handout 1 and Handout 2. The remaining three bites can be found at these locations: Tapa #2 – on learning outcomes; Tapa #3 – on assessment of learning; and Tapa #4 – on learning and teaching activities. Summer Course (Re)Design Season begins anew; that in mind, we’re running the 4-part course design tapa series: short bites moving from scanning the environmental context to setting outcomes to planning activities and assessments. Enjoy.